Are you considering implementing a workplace financial education program? Start the process by answering the “five Ws,” says one expert. “A thrown-together program is going to get you only so far. 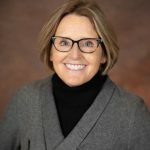 An effective financial education program starts out with a well-thought-out plan,” said Karen Hall, vice president of Financial Education and Employer Services for T.E. Wealth in Calgary. Hall was one of three presenters for the recent “Financial Wellness in the Workplace—A Prescription for Prosperity” webcast. 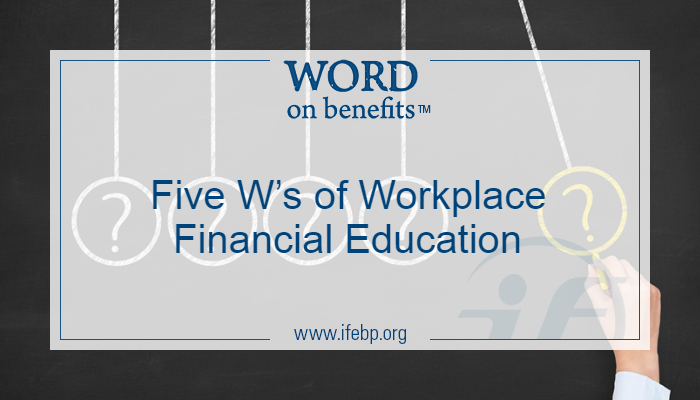 Why have a workplace financial education program? You should start by developing a clear idea of the objectives you want to achieve, such as increasing pension or savings plan participation, improving retirement preparedness or fulfilling governance obligations. You may need to consider whether special situations–maybe a change in the pension plan or a need to reach a targeted group–are driving the need for the program. What are the intended outcomes and challenges you expect to encounter? In other words, what do you want employees to learn, know or do? Ideally outcomes should be specific and measurable—a 10% decline in calls to the employee assistance program or getting 50% of employees to update their investment allocation profile during a two-month campaign. “Set yourself up for success by dividing your outcomes into short-, medium- and long-term time periods,” Hall said. For example, reducing stress is a behaviour modification that might take longer to achieve and might be harder to quantify than increasing employee participation in a retirement savings program. You should also identify the challenges you face, which might include employee literacy, geography (where employees are located), budget, resources and time. Who is the target audience? “Take a close look at the makeup of your folks. Are you looking to provide this program to a broader population or to one segment?” Hall asked. Organizations should look at the number of employees who fit into each ten-year age band but also consider years of service, language proficiencies, who has access to computers—both at home and on the job—and who can attend group sessions. Surveys and focus groups can also help guide the program. Where will the program be delivered? “If you had one group of people who were all in the same place and you could shut down for an hour or two periodically, that would make delivering an in-person program less challenging, but of course that’s not the case for most people,” Hall said. You should look at the number of locations and whether employees are in offices or in the field. Options for addressing geographic challenges might include webcasts and videoconferencing or rotating in-person sessions so that each site hosts a session once every few years. Combining financial education presentations with other workplace meetings is another strategy employers have used. Hall works with one organization that has a library of ten five-minute videos that are played at safety training meetings. When will the program be delivered? You should determine the timing of every stage of the program from development to rollout and beyond. Maybe you’ll decide to offer a pilot program or test online tools or ease into the program by starting with one delivery channel like a webinar focusing on one targeted group. Turn to the International Foundation for resources to help with your workplace financial education. The Financial Education/Retirement Security website is packed with resources for plan sponsors. 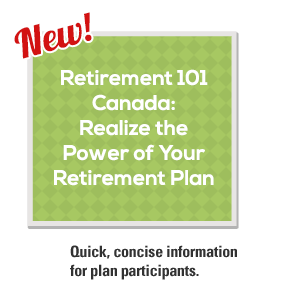 The Retirement 101 tool offers information for plan participants in an interactive question-and-answer format.